The other day I was walking to work and decided to cut through Madison Square Park because there’s often something interesting going on there, like an art installation or a festival. It was a beautiful, sunny spring day. And yes, there was something going on. From across the street it looked like there was some sort of trade show booth with signs that said, “Be a Farm Hero!” Of course I had to check it out! It was kind of funny; halfway across the street, I could tell it wasn’t really about farmers—the whole thing was too slick for that, too corporate. I figured it was probably more about a big company involved with farmers, like Cargill. Then I noticed the wall of vegetables and fruit in crates with little googly eyes glued to them. I saw the brand Saga but didn’t recognize it (is it a yogurt?). The stand was not really “open” yet, but there were PR people and cameras getting set up, as if for a big event. Now, Rebecca Coles, I’m sure, is a very nice person, but she is no urban farmer. I thought about Ian Marvy, of Added Value, a real organic urban farmer in Brooklyn. He’s a real farm hero. He was nowhere in sight. 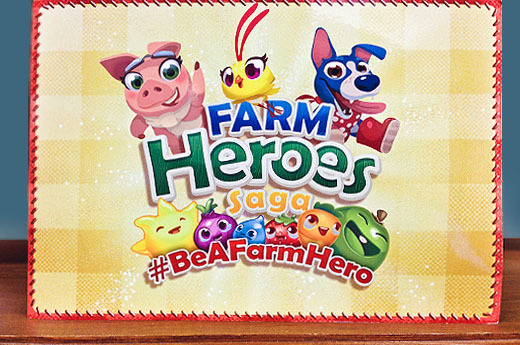 Well, it turns out Farm Heroes Saga is a new game from the people who made Candy Crush. The only reason I know about that game is that I get Facebook invites to play it. (By the way, Facebook friends who don’t actually know me in person, I don’t play games on Facebook, so you can stop inviting me.) I got two invites to play Farm Heroes already this morning. I’m not opposed to games, mind you. In fact, I think they can be good ways for people to get to understand something or do something different. Although, it never ceases to amaze me how devoted my kids can be to their online pets—feeding them, bathing them, walking them, playing with them—while not at all being interested in feeding their real pets in real life. But back to Madison Square Park—which I walked away from with mixed feelings. Good: At least it’s a game about farming. Bad: I wish they’d have worked in some organic stuff. Good: Farm Heroes is a healthier idea than Candy Crush. Bad: Too bad people are spending their time on this rather than real life. Good: Maybe if this game is popular, their next one will be about organic farming. Bad: Too bad the game companies are getting people’s time and money rather than the farmers. Good: It’s a beautiful day in the neighborhood. Bad: Nothing…nothing is really bad. So, if you are a Farm Heroes player, let me know if there is anything organic about it. I considered playing it just to see for myself, but I really don’t have the bandwidth or desire. People often ask me how I do it all, and one way is that I rarely play games. The tagline for this game is “grow your own cropsies!” Well, I did just plant my peas. In real life. And then I get to eat them. In real life. But if you want to play, don’t let me stop you. 2 Responses to Be a Farm Hero?! I don’t play games either, because I would rather read, or walk through the Botanic Gardens, or water my flowers, or read. But I am always amazed at how many ‘games’ there are out in the world and never have been sure what they do for the folks who love them. But I do hope there will be a game someday for the organic farmers, and that will inspire and create more organic farmers! And now I want to go take a walk through Wheat Ridge’s Prospect Park and look for the Great Blue Heron nest!! No games, just a Mom and Dad Heron sharing nest time on their eggs. I agree with you Alice. I don’t find games stimulating or what others refer to as “fun”. Personally, I would rather read a book or work on puzzles.